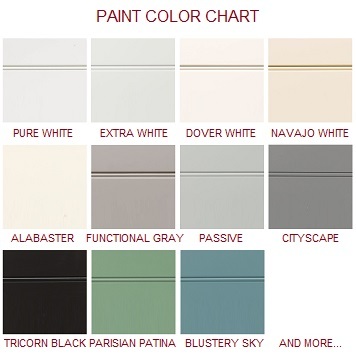 Painted cabinet doors, made from MDF and paint-grade products, are also available. All finished items are coated with a clear, 20-degree sheen topcoat. Prior to finishing, Horizon Cabinet Doors are sanded both by hand and by automated sanding techniques to deliver a smooth, finish-ready product. 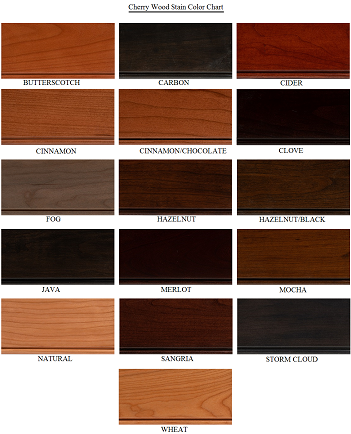 To be absolutely sure of your color choice, Horizon recommends that a finished sample door be ordered prior to placing a larger order. We do not offer services for matching existing colors. Quarts and gallons of stains and glazes are available in the Accessories menu. Our paint colors are based on colors that are available at Sherwin-Williams. Although the result should closely match a S-W color chip, it may not be exact. If an exact match is required, we recommend purchasing a sample door or drawer front before making a larger order. 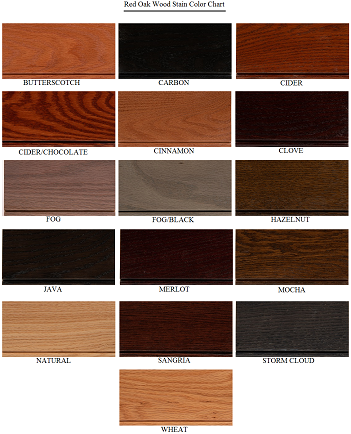 All Horizon stain finishes are applied using a hand-rubbed application. The hand-rubbed process provides superior grain penetration of the finish material and a greater degree of depth in the finished product. A glaze is an extra finish layer designed to highlight beads and grooves in the door, drawer front, moulding or other finished item. The glaze will change the overall color of the piece slightly, but that is not its primary purpose. Glazes are applied using a hand-wiped application process to the entire surface -- face and back -- of the piece. Glazing is a very subjective treatment. Each piece will be unique in its appearance. Our experienced finishers compare each glazed door to a control sample to ensure a certain consistency, but each door will still take glaze differently which makes color consistency more difficult to control than on non-glazed products. After staining, each finished item receives sealer and topcoat. The sealer is a high solids material that is applied, dried and then sanded with a fine-grit sandpaper. The final coat is a high solids conversion varnish that results in a beautiful finish with exceptional clarity, resistance to moisture and overall durability. After curing, doors are inspected before being packaged for delivery. 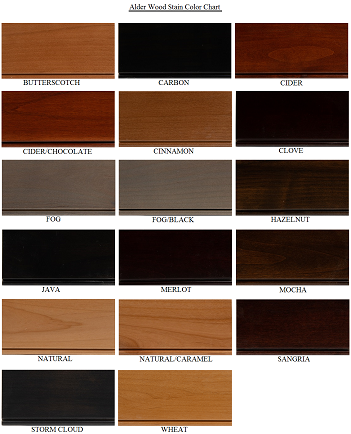 Cans of stain and glaze are available for purchase (see the Accessories tab) so that you can closely match the appearance of other wood items to the Horizon doors. While we provide instructions to help you get the best match possible, we cannot guarantee that there will be an exact match between the purchased items and the items that you finish. 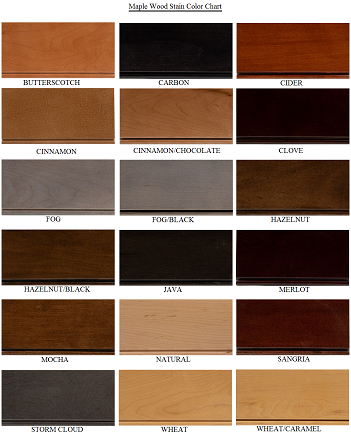 Application of finish on veneers and decorative accent items may result in slight color variations. Cans of paint can be purchased at your local Sherwin-Williams dealer. IMPORTANT: Although our color mixtures in both stains and paints are carefully controlled, your application of the finish can potentially darken or lighten the color. We strongly recommend that you refrain from applying finish to face frames or other pieces that will be located close to the purchased products until you have at least one of the doors or drawer fronts on-hand to serve as a reference. Horizon cannot predict how a door, or portions of a door, will accept stain. For example, the pores in maple, in particular, are inconsistent so that darker stains may not be absorbed evenly. If a door meets our material specification standards in its unfinished state, it will be considered acceptable after finishing as well. Although steps are taken to minimize dark end grain, Horizon uses wiping stains which penetrate the wood. The end grain will stain and glaze darker than other areas of the piece. This will not be considered defective. Glazed products will vary in appearance. Horizon considers these slight variations acceptable and they will not be considered defects. Painted products will use the defined Sherwin-Williams paint color, but because of the application technique and the clear lacquer top coat, the final product may not exactly match customer-applied finishes. Horizon's finishes carry a one year limited warranty against peeling, blistering or cracking, but no warranty against discoloration. Horizon assumes no responsibility for damages or poor color match when finish is applied by the customer. Most wood species will naturally darken with age. Although Horizon uses a topcoat that contains a UV inhibitor which will minimize the effects of color change, we will not be held liable for the change in appearance of any product, finished or unfinished, due to this natural aging process.